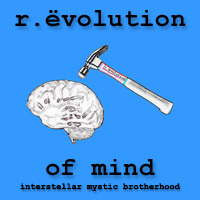 r.evolution of mind - ¿WHAT? The r.evolution of mind sees itself as a community uniting people who take keen interest in their spiritual development. It enables exchange and discussion, inspiration and mutual assistance. Furthermore, others attention to the possibilities of spiritual development should be called unconstrainedly through the participants` actions. The form of expression is completely left to the participants` discretion. The location of his action is indefinite as well. The WWW serves as medium of communication because it enables fast and uncomplicated communication. However, this should not replace face-to-face contact, because it is desperately needed for the accomplishment of exchange and discussion. The possibilities of expressions are as boundless as the possibilities of consciousness. The acted out creative dialogue of consciousness with the world is the aim of this community-platform. Neither material nor ideological targets are pursued.